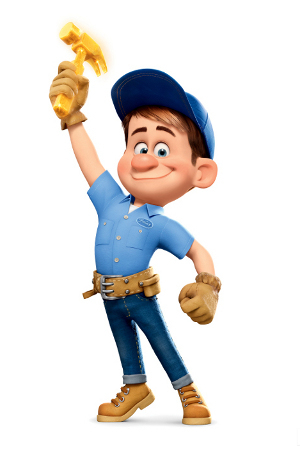 The Story So Far… » Blog Archive » I Can Fix It! Today’s backyard task is getting the water fountains running and mow the expansive Casa del Garrett lawn. I have two small illuminated water fountains for the backyard, one shaped to look like a small polished ball of granite with a section cut out of the top where the water percolates. It’s actually made of plastic…a real granite one would have been too heavy and too expensive. But it looks very convincing. Before putting it all away last winter I hosed it down and discovered to my dismay that the paint was flaking off. So one task today is to repaint those areas, matching the original simulated granite coloring. So all that time spent in the 1980s as an architectural model maker, making realistic models of buildings and lobbies to be made from various materials from the samples I was given, is still paying off. Or maybe it’s the years before that I spent painting imaginary landscapes. Anyway, I am not buying another water fountain just because the paint flaked off this one when I washed it down last year. Last year I bought a small planter shaped and painted to look like a rock, and this spring when I began waking up the backyard garden I saw that it had started coming apart, probably because even though they sold it here in Maryland, it wasn’t made to take below freezing temperatures. The plaster it was made of was cracking and coming apart and when I got done removing all the loose plaster about half the outside of it was a mess. So I bought some plaster of Paris and reshaped it. But then I cheated and bought some Rustoleum rock textured spray paint because so much of it was gone I really didn’t need to match much that was still there. I still have several outdoor solar light things I need to fix. There’s a solar turtle whose shell lights up at night…it’s lamp is apparently broken and, surprise, surprise, the only way I have of replacing it is cutting a hole in the bottom of the turtle. They just glue everything together now and expect you to throw it away when it breaks. Also, I have a statue of a boy with a jar of lightning bugs that I’ve had for a few years now. His jar lights up at night but the batteries inside are not holding much of a charge anymore and, surprise, surprise, there is no way to replace them other then I somehow melt off the hot glue holding his on off button panel and get inside. Plus, years of summer sun have faded his paint and now he is looking a bit anemic. So I need to repaint him and put in a fresh battery. I have no idea what I’m going to find when I get inside there, and I’m still not sure how I’m going to open up the turtle; the plastic they cast it out of is pretty thick. I suppose you could say I’m wasting the precious minutes of my life fixing things I could just as easily buy new, but I can’t bring myself to throw something away that I can fix. I could spend the money but money is also time out of my life in the sense that I had to work for it, and I’ve already spent money on these things so throwing them away when I could fix them would amount to wasting a part of my life too. But deep down inside I just can’t stand the idea of throwing things away that can be fixed.